I’ll write a few posts on our wedding planning, but let it be known that I’m not one of those women who has pictured my wedding since I was a little girl and thinks wedding planning is SO fun and exciting. When we first got started I had no idea what I wanted and found the impending process to be really overwhelming. Now we’ve taken it one step at a time and I’m feeling much calmer. It’s a lot of research, discussing logistics, and writing emails. To me it resembles work more than fun, but getting another component checked off the list sure is satisfying. However, one thing that has made the process more bearable is that all the people I’ve communicated with are so nice. To most people this would seem natural– of course the vendors are nice; they want me to pay money to use their catering, their venue, etc. But living in Estonia has dramatically lowered my expectations for employees of the service industry. 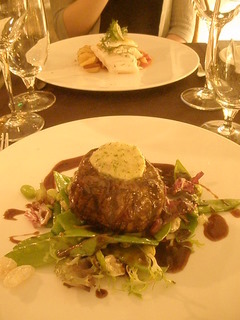 This was a dinner with actual good service that I need to write about! While customer service here has been getting better year by year, it’s still a far cry from what you would find in North America or England. Sub-par service has its roots in the Soviet era, when surliness was the norm and nobody was expected to be polite to somebody they didn’t know. It was enough for restaurants servers and hostesses to show up for work– they didn’t actually have to serve anyone. I’m not speaking from experience because I never visited Estonia when it was still a part of the Soviet Union, but I’ve heard stories of clients being turned away from a restaurant being told, “We’re full”– when the restaurant was clearly empty. If you were lucky enough to be seated, more than half of the items on the menu might not have been available that day. Today, the situation has improved. The cashier at the grocery store will generally say “tere” (hello), but she won’t make small talk. Workers on the floor at a pharmacy or clothing stores might approach to ask if you need help finding anything. And servers in restaurants will often smile and even come by the table after you’ve gotten your food to ask if everything is OK (when I first came to Estonia 5 years ago, this was never done). There are also plenty of crappy experiences to be had– woefully untrained servers who lack skills (like opening a wine bottle) and have no idea regarding what’s appropriate and what isn’t. Quick example: in January of this year I was at a pub and the waitress came to tell us our table was reserved and we had to move. We then had to transfer our own drink glasses and several plates of food to another table, with no help from her. It was so awkward and embarrassing, and we didn’t even get an apology. Sorry for the long preface, but being accustomed to experiences like that really makes me appreciate how friendly and helpful people in the wedding service industry have been. 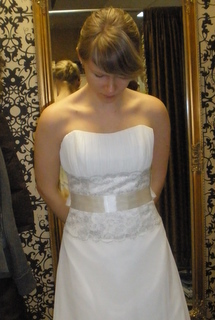 The girls in the bridal shops were sweet and respected my wishes (no puffy princess dresses!). The caterer we chose responded promptly to my dozens of emails with questions and requests to make changes in the menu. I don’t know if the people in this sector are nice because they believe in the whole “this is you day and it should be special” thing, or because so much money goes into weddings (OK, I’m not that naïve– I know it’s the latter), but either way they’ve made this process that I was dreading much easier. And for that I am thankful. I know I just wrote a post about change, but I feel the need to return to the topic for a bit. 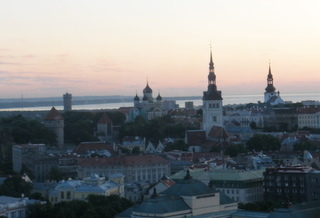 I know I rarely post anymore, and I think one of the reasons is that I’ve been living in Tallinn and working at the same job for 4.5 years now. Although new things do occasionally come up, there are very few aspects of Estonian life that surprise me anymore. It all feels so routine now. All around me I see people experiencing something new. Blog reader Meg has lived in Sweden for a few months and writes about her new Swedish life. I have a few friends who just recently moved to Estonia and fill Facebook with breathless status updates about how fun and exciting it is. My own fiance just got a new job, as did my good friend in the USA– both of them are now in exciting positions that offer amazing opportunities. Seeing everyone else’s changes somehow makes my life seem stagnant… but I refuse to let myself feel negatively about it. For one thing, I still love my job! I work as a translator, and while I don’t get paid a lot, I enjoy my flexible workplace, my great colleagues, and learning more about the languages I use every single day. So there’s that. Also, it’s not as if nothing in my life is changing– I am, after all, getting married in September! And I’m planning a wedding in Estonia, which is not something I ever would’ve guessed I’d ever do (but I’m so happy that I am). What I’m trying to say is, I won’t allow myself to think that my life has somehow become complacent or boring. New and interesting things are going on all the time– I just have to notice them! 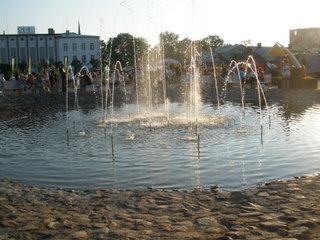 There are aspects of Estonian culture I’ve still never addressed on the blog. I cook new things all the time. And then there’s the once-in-a-lifetime adventure of wedding planning! I haven’t run out of material– for some reason I just haven’t been thinking of my life as fun and interesting lately. Seeing other people discover something new has inspired me to adopt a fresh perspective and find something new and exciting in each day. I was going to write a Lent update today, but when looking at posts from Lent last year I discovered this one about J discovering how delicious peanut butter is. That actually never became a problem– he doesn’t eat it on a regular basis so my stash is still my own– but what I was floored by was how the price of peanut butter has changed. 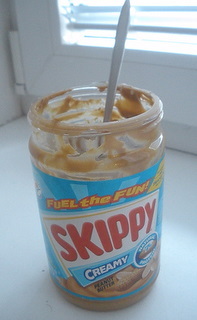 Less than one year ago, I wrote that I paid 3.50 EUR for a jar of peanut butter at the Stockmann grocery store (which, as far as I know, is the only place that sells the American brands). Do you want to know how much I paid for a jar from that same store about 2 weeks ago? 5.60 EUR. That’s $7.50! I know it’s ridiculous, but I was desperate. Fortunately we’re going to the States again in just a few short weeks (I can’t believe we’re going again so soon!) so then I can stock up on peanut butter that isn’t absurdly overpriced. So the price of peanut butter changing is clearly not so nice. But some change is good– like, for example, J getting a new job at an exciting Estonian company! Our everyday routine is much different now, mainly because he used to work from home so he’d pretty much always be here. Now he works long days and gets home after 7, which means I have some time to myself at home (which used to happen very rarely) plus I’ve been cooking more so that dinner will be ready when J gets home (yes, I’m such a good little soon-to-be-wife). Hopefully some of my cooking will make it onto the poor neglected blog eventually as well. Oh, one more change just came to mind! Please don’t hate me when I say this (it kind of makes me hate myself a little bit), but I’ve become one of those people who loves exercising in the morning. I used to be a solid after-work-and-on-weekends runner and I thought that exercising before work would make me get sleepy during the day. But somehow I discovered that waking up just half an hour earlier and running before work leaves me feeling amazing for the rest of the day. I know, what an annoying thing for me to say… but it’s true! I must confess that there was also an external factor motivating me to get up in the mornings– every since the new year began it has been so hard to get a treadmill at the gym after 5 pm, but in the mornings? The place is practically deserted, and I rather like the feeling of having the gym to myself! Remember when I ran my first half marathon last year? J and I knew that we definitely wanted to do another one this spring/summer. It took some time to find one that fit our schedules — we didn’t want to do Helsinki again, and a half marathon-ish trail race (the distance is actually 23.4 km — random) interfered with J’s exam schedule. 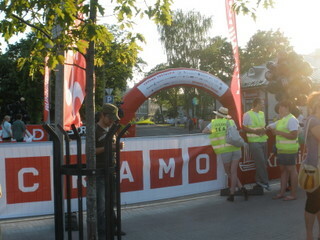 Then we discovered a race being held for the first time: the Rakvere Ööjooks (Night Run), which offered three distances (5k, 10k, half marathon) and was taking place the night before a big song festival in Rakvere that my choir would be participating in. Perfect! But of course race prep doesn’t always go smoothly. My left IT band (which connects to the knee) started bothering me and I had to skip many training runs, especially longer ones. My knee would be fine up to a certain point, but after 10 km I’d start to feel tightness and then pain. I started stretching and doing exercises to strengthen my IT band. J also had some issues and had to stop training for a while. At one moment it seemed like we both might be dropping down to the 10k or even the 5k distance. A week before the race I ran 10k with no pain and decided to go for the half. J, unfortunately, decided not to run at all. However, a friend of ours was also going to be running, and just before the race started we decided we’d start off together and see how it goes. I was worried about so many things. I worried my knee pain would get so bad I wouldn’t be able to continue, or that I’d just be too tired. The race was starting at 9:30 on a Friday night, and it had been a hot and tiring day. I’ve only even done long runs when I’m well-rested on the weekend! And what if my training hadn’t been sufficient? Overall I have to say the race was a huge confidence-booster for me. The half marathon distance still intimidates me, but even in less-than-ideal conditions I managed to do really well. I’ve clearly developed as a runner, so hopefully the next time I do a half I won’t be so scared beforehand! Number of days until my mother comes to visit: 8! 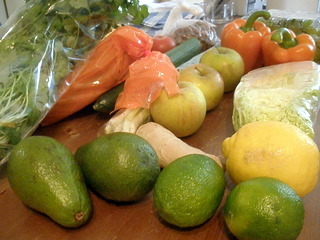 Now that my few days (from Friday night to Tuesday night) of mostly-raw eating are over, I’ll share my general impressions. It was easier than I expected. With the fridge filled with fresh fruits and vegetables and a list of raw recipes or combinations I was eager to try, eating more raw food didn’t feel like a chore (of course, I happen to be a person who likes fresh fruits and veggies anyway). It was fun, and there were plenty of things I’m going to continue doing, like replacing noodles with veggie strips and making a big salad with tasty guacamole on top instead of dressing (that was lunch on Tuesday). Some meals left me full, but not satisfied. For example, my lunch on Monday was lettuce wraps stuffed with guacamole, cilantro and veggies, along with some raw cauliflower on the side. I think it lacked variety in terms of texture, so I got really bored eating it and when I was done I felt full (hello fiber) but not at all satisfied. Eating high-raw for a longer period would definitely require figuring out how to incorporate enough fat and protein to make meals satisfying. I said I’d try to avoid processed sugars, but I didn’t. I ate some cookies. Sugar is clearly my weakness (sorry I’m not sorry). The cookies also contained egg, which I was avoiding during the experiment. 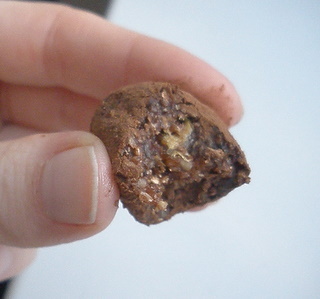 I made some mostly-raw cocoa bites that were very good, but didn’t always satisfy my sweet tooth (because they turned out not very sweet – next time I’d add more honey). Other than the egg in the cookies, a bit of cheese on Monday night when I had a friend visiting, and honey, I didn’t consume any animal products from Sunday until Wednesday evening. In general I don’t find them difficult to avoid. I missed grains. Not necessarily the processed white flour that was found in those cookies, but oatmeal, wheat bran, and other grain products that are plant-based, healthy and satisfying. I didn’t mention this at the beginning, but I also gave up coffee during the experiment. I decided that tea would be allowed, since it is plant-based and beneficial and because I wasn’t interested in torturing myself. But the coffee thing was surprisingly easy – I got a headache around 4 pm on Sunday that may have been from lack of caffeine. Monday I had some black tea in the morning and Tuesday I had fruit tea and didn’t miss the caffeine at all. I didn’t even really miss the taste of coffee – I think it’s just become such a habit in my workday (I only have one cup a day, which I drink slowly). I think I may alternate coffee and tea days from now on, since I clearly don’t really need the coffee (and I would rather not get addicted, if I can help it). I’ve never given much thought to the British royal family, but it was impossible not to get a little swept up in all the excitement of the royal wedding today. I’m glad I live in a time zone that’s two hours ahead of London, so I didn’t have to wake up ridiculously early to watch coverage or anything. I was able to check it out in the middle of the work day (everyone at my work was watching! ), seeing the most important moments– the bride’s arrival at the Abbey, walking down the aisle, the vows, and later also their kiss. I have to say that I particularly enjoyed the moment when Kate was walking down the aisle and Harry turned around to get a look at her and then whispered something to his brother, who was dutifully facing the altar. That was cute. Now if, years from now, somebody asks if I was watching when Will and Kate got married, I can say that I was. (Fun fact: If it ever comes up in trivia, I can answer the question “What day did Diana marry Prince Charles?” in a heartbeat, because it happens to be the same day my brother and a good friend of mine were born, July 29 1981). Anyway, all this talk about the royal wedding (and the royal wedding digestive biscuit cake!) had me craving digestive biscuits, which have long been a favorite of mine. 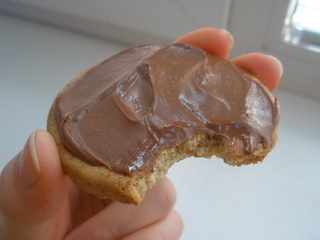 So I picked some up after work and had my own little wedding cake-inspired snack — a digestive biscuit with a bit of Nutella. Mmm… a very sweet day, indeed.